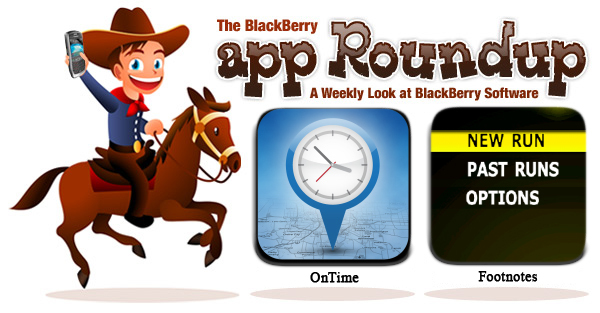 BlackBerry App Roundup for February 4th, 2011! Win 1 of 10 copies of Air Share! Howdy and welcome to the weekly app roundup! So how many of you Beta Zone users were able to nab the new BlackBerry Radio? From the description, it sounds like a winner, but since it’s only available in the US, the rest of the world will have to wait and see. Oh well, at least Canada can enjoy Dragon for Email now. Today, we announce the winners of the MemoryUp Pro giveaway and also give you the chance to win one of 10 copies of e-mobile Air Share! Have a rootin’ tootin’ weekend! Giddy up! Contest: Win one of 10 copies of e-mobile Air Share! Sentinel Xlator - Xlator is a translation application for your BlackBerry smartphone. This is an easy to use application to meet your translation purposes. Application supports more than 52 language combinations- Gives you the ability to communicate with people other than your language. The translation service is powered by Google(TM). 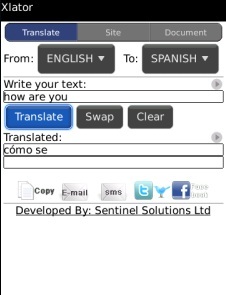 You can send translated text via email/sms or copy and paste anywhere. You can also put the translated text as status message in Facebook or Twitter. You can also translate websites or a file in your device. Multitext - Ever need to send the same text message to multiple people and did not want to retype the text over and over to each person you send a text to? Maybe you have a carpool and you want to tell everyone at one time that you are on the way. Multitext is for you! 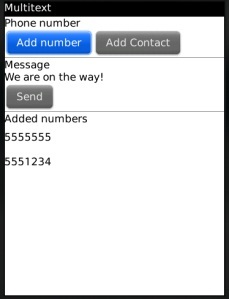 Multitext is used to send a single text message to multiple destinations. 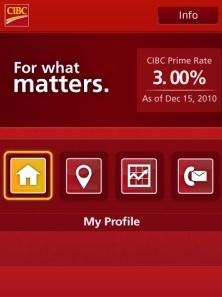 CIBC Home Advisor - Introducing the CIBC Home Advisor Super App, for house hunters looking to make their home purchase easier. Access expert mortgage advice wherever you are, whether you’re exploring neighbourhoods, visiting properties, or simply doing research. ZonaSnap - ZonaSnap is an application developed by Javiergv (Staff of ZonaBlackBerry) which allows you to capture the screen of your BlackBerry and then gives you a range of options such as; send to Twitter, send to BlackBerry Messenger (Not supported for OS 6), save, send as Email and send to Photobucket. It's the union of these features that makes ZonaSnap unique. It’s very easy to use and also highly practical. The application is available in two languages English and Spanish. Zonasnap added as a menu item with options to remove. 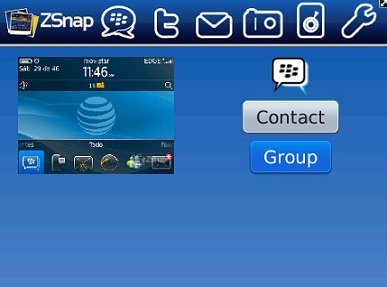 Send snap of your screen without saving straight from the screen as email, to Photobucket, Twitter, BlackBerry Messenger Contact or simply save to SD card under your pictures folder. Can be added as a convenience key. Really small in file size. When used from the menu it gives you a preview of your screen shot. Files can be saved as jpg or png format. After the capture is sent to Photobucket, you will receive a notification in a window reporting that the image code has been received and it has been inserted into Memopad. Short vibration to let you know the snap has been taken, with option to remove this alert. Options to add a Water Mark and rotate it, add Opacity, Scale and Align into the Capture-this Water Mark can be selected from the SD Card pictures. Full 7days Trial. After the expired trial all the main options will be available, except the selection of the watermark- will be set a default water mark in the capture. Options to change the quality of the capture in the format jpg. Dragon for Email - Dragon for E-Mail is an easy-to-use email dictation application powered by Dragon NaturallySpeaking that allows you to easily speak and instantly see your emails by simply dictating directly within the BlackBerry® email client. 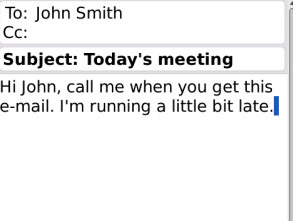 You can just open up your email client and start dictating anytime you want to send an email message. In fact, it’s up to five (5) times faster than typing on the keyboard. Dragon for E-Mail helps you to stay connected and be productive no matter where you are. Dragon for E-mail covers your end-to-end email needs - from dictating contact names and subject lines, to dictating short or long email messages – and you can reply, compose a new message or forward one. SUPPORTED DEVICES: For a list of supported device/carrier combinations, please go to http://www.dragonmobileapps.com/bb/supportemail.html and review article entitled "Which devices are supported?" from the "System Requirements and Installation" section. OnTime - OnTime uses your existing calendar and your location to remind you when to leave to make it to your next event on time. The traffic aware program also allows you to inform other attendees when you are going to be late or on time by either text message or email alert. When you arrive, you can check in to either Facebook or Twitter and you have the option of walking directions or driving. Ontime is very versatile and allows you to filter your calendars and disable events if you wish. 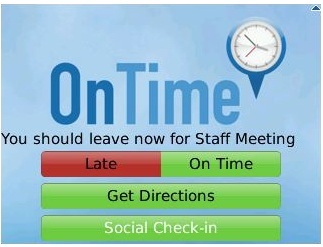 OnTime is the one app intent on making your life easier, one event at a time. mybox - All mybox accounts have been upgraded to 1GB. Subscribe today to upgrade your box-we offer the most competitive prices starting $9.99/yr (the cost of 2 starbucks coffees). Access your files from home, work, school etc... and share files with anyone worldwide all within a regular mobile friendly web browser interface that everyone is already accustomed to. 5, 10, and 20GB drives using the easiest system to use in the world. The easiest way to share larger files from your smartphone with your computer. OTA support is also built-in, this features allows you to upload files for the purpose of sharing with others on a download basis. Multifile upload is also built-in (some browsers are not supported for these specific features). Our system is fully automated and you won't have to wait until an administrator creates your account like other sites. The service we offer you isn't breakthrough technology. It's the combination of a few technologies to provide a system that enables convenience at the highest levels. Also, at the same time it frees you from the constraints of file sharing with flash drives, and other means such as email(usually if your attachment is over 10MB you will have problems). 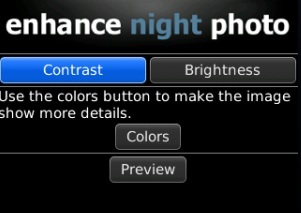 Enhance Night Photo - Enhance Night Photo allows you to enhance dark images and create cool looking (and clear) images. You can use the application to make really dark photos brighter by changing the brightness, contrast and or apply color filters (over 8 cool filters). It’s not only functional (for dark photos); it’s also fun to create cool looking images! Footnotes - Developed by a committed group of dedicated runners, Footnotes is the ultimate mobile fitness app for BlackBerry users. 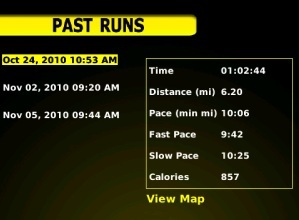 It is clean and simple to use allowing you to track and calculate your TIME, DISTANCE, PACE, and CALORIES burned. When you’re done, Footnotes provides you with the options to review, save, and share your run! Using your BlackBerry, you can now run more effectively and efficiently without the need to carry the many peripherals and devices you once did! Air Share - The most powerful file sharing tool on the market! Support file sharing among different mobile devices and PC. View the BlackBerry file system both internal and SD memory card. No need for a USB data cable, send movies, pictures, music and office documents directly to your device and view them from device built-in media player or office document viewer. Browse, view, and delete files on device directly from the application. We have 10 copies of Air Share to give away! All you have to do is leave a comment to be entered. Winners will be announced next week. Now, for the 20 winners of MemoryUp Pro. Well there you have it folks! I hope you enjoyed the apps we managed to corral this week. If you have any information on software (including news and tips), or if you are developer looking to be in the spotlight (or contest) let me know via email at blundell@crackberry.com or on Twitter at twitter.com/ryanblundell.